California: It’s the home of Hollywood, aquamarine-colored waves, and, of course, the Happiest Place on Earth, Disneyland® Park in Anaheim. The first of two parks that comprise Disneyland® Resort, Disneyland has the honor of being the only Disney-themed park to have been built under the discerning eye of its namesake, Walt Disney. Disneyland® Park is over 60 years old, but you wouldn’t know it to visit it. It boasts eight "lands" -- each with a distinct theme -- ranging from nostalgic (Frontierland) to futuristic (Tomorrowland). With all the shops, restaurants, attractions, shows, and, of course, Disney characters galore, it’s easy to get swept up in the excitement and end up spending your entire vacation in one or two lands. But this would be a mistake! Disneyland® Park has so many exciting things to do that you’ll be missing out if you don’t get to experience some of the top attractions and rides. 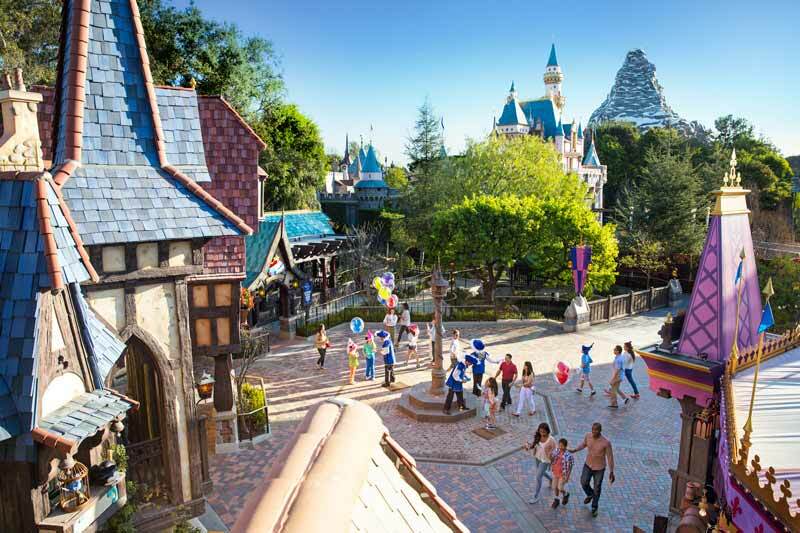 This guide will be your best friend when planning a trip to Disneyland® Park: it provides a sneak peek at the top attractions, restaurants, and shows for each land so you can be sure that you get the full Disneyland® Park experience. You’ll also learn about your options for accommodations at Disneyland® Resort, whether you want to stay at Disney-owned hotels where you can literally live, breathe, and sleep the Disneyland® Resort experience, or bunk at a nearby hotel that’s within reasonable proximity of this magical park. There’s a lot to explore at Disneyland® Park, no doubt. It’s tempting to grab tickets and start exploring in an excitement-fueled sugar rush. However, wise guests may want to do a little research before their visit to make sure they cover all their bases. Find out where to get the best prices for tickets, the best time to visit to avoid crowds, where to stay to fit your budget, and, of course, plan out your "must-do" list. Disneyland® Resort offers multiple resources for savvy tourists including pre-arrival tips, a mobile app to help you navigate the park and find out wait times for top rides, and an FAQ section that covers everything from vacation planning to travel insurance. There’s even an entire website devoted to planning your trip, chock full of brochures, videos, and other content to ensure that you get the most out of your Disneyland® Resort vacation. Take advantage of these resources and you’ll be on course to have the best vacation of your life. Disneyland® Park is located at 1313 Disneyland Drive in Anaheim, California. Hours of operation vary depending on time of year and day of the week but range from 8am-12am. Disneyland also offers "magic hours," an early admission option available on select days for Disneyland Resort Hotel guests, as well as "magic mornings," which allow guests with 3+ day tickets to enter Disneyland® Park one full hour before the parks open (this is only available on certain days, so be sure to check details before going). The full calendar of operating hours can be found on the Disneyland® Resort website or the Disneyland® Resort app, so make sure to check it while planning your trip. You can purchase tickets for Disneyland® Resort theme park through multiple channels, including CityPASS, where you’ll score a great discount on several popular Southern California attractions. Adventureland: A jungle- and rainforest-themed land where you’ll get to explore Tarzan’s Treehouse and brush shoulders with characters like Jasmine and Aladdin. Critter County: Tucked away in a corner of the park, this land offers a respite from the hustle and bustle of the other lands but also boasts the ever-popular Splash Mountain ride. Fantasyland: Allegedly Walt Disney’s favorite land, it’s modeled after a medieval Bavarian village and is your opportunity to indulge in fairy tales and magical experiences. Frontierland: Peek into a nostalgic view of 19th-century Wild West American pioneer life, complete with a train ride through an explosive mining town. Main Street, U.S.A.: This main drag offers a nostalgic glimpse of small-town America in the early 1900s and culminates in the famed partners statue depicting Walt Disney holding hands with Mickey Mouse. Mickey’s Toontown: Imagine walking into an animated world where popular Disney characters reside in topsy-turvy houses and cheerful music emanates from every building. New Orleans Square: The Big Easy reimagined in its 18th-century glory, complete with elaborate building facades and the smell of enticing southern cooking. Tomorrowland: Disney’s nod to innovation and exploring the unknown. Blast off to infinity and beyond and meet some of your favorite characters from a galaxy far, far away. There’s no shortage of places to stay near Disneyland® Resort. Rather, the challenge is choosing one that suits your budget, needs and personal tastes – with so many to choose from it’s easy to be overwhelmed by your options! 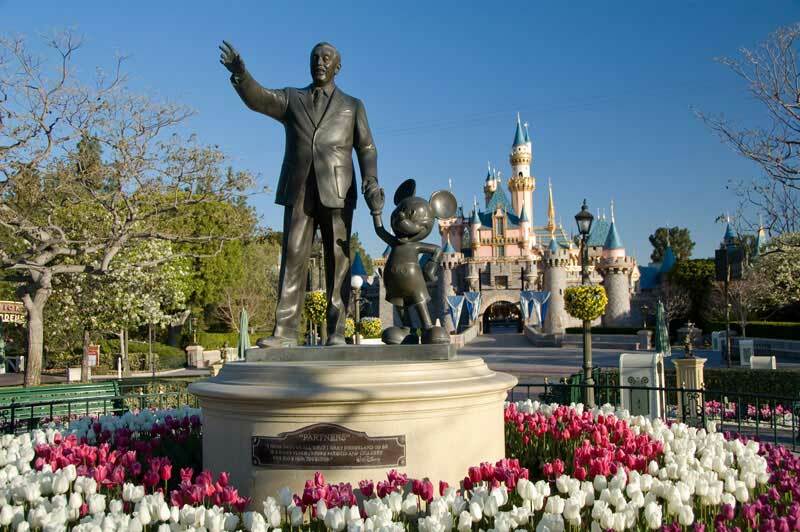 Disneyland® Resort has hotels within spitting distance of the park itself, but there are a multitude of alternatives nearby that offer shuttle service or that are close enough that getting to and from Disneyland is incredibly easy. Every hotel near Disneyland® Resort has its own special set of amenities and personal touches that are sure to make your nights as sweet as your days. Disney’s Grand Californian Hotel® and Spa: The most expensive of the hotels, these lavish accommodations feature whimsically decorated rooms and a relaxing spa on premises. There’s even a special theme park entrance exclusively for hotel guests so they can come and go with the greatest convenience. Disneyland® Hotel: This hotel manages to extend the ambiance and joy from the park into each of its ultra-modern rooms. The towers that comprise the hotel are named after the park’s three original lands (Adventure, Fantasy, and Frontier) and rooms include creative touches like light-up Sleeping Beauty Castle headboards as well as state-of-the-art amenities. If you’re really keen to splash out, book a Signature Suite where you can live out your fantasy of being a princess, pirate, or even the mouse himself in the grand Mickey Mouse Penthouse. Disney’s Paradise Pier® Hotel: A charming combination of retro beachy and modern comfort, the Paradise Pier Hotel rooms are outfitted with sand-and-surf-themed décor and even boasts a rooftop pool with a waterslide. Don’t miss your chance to dine with Donald Duck and his friends as part of Donald Duck’s Seaside Breakfast at Disney’s PCH Grill. If you prefer to take a break from the magic of Disneyland® Resort during the night or are unable to secure an on-premise room, there are plenty of hotels in close proximity to Disneyland® Resort. Disney even has partnerships with almost 50 hotels––collectively known as "Good Neighbor Hotels"––that are of Disney caliber but aren’t situated in the Disneyland® Resort. 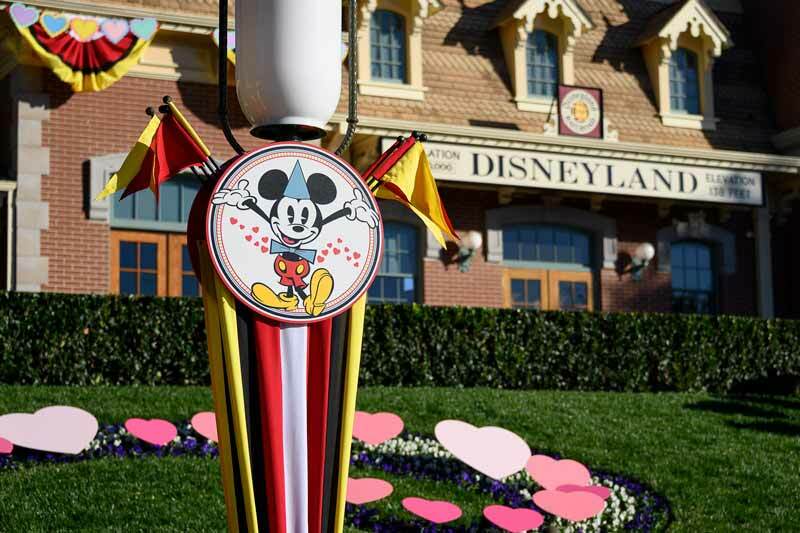 Virtually all Good Neighbor Hotel packages will run you at least $700 per night, but depending on the room, can sleep up to six adults and include a Disneyland® Resort Park Hopper® Souvenir Ticket that can be used for as long as you are staying the hotel. The hotels range from "moderate" to "deluxe" and are happy to accommodate groups of all sizes and ages. If you’re looking to save your pennies for souvenirs or Disneyland MaxPass® Service (to save time in lines) there are a number of options in the Anaheim area including the Anaheim Marriott, Hilton Anaheim, and Four Points by Sheraton Anaheim that are more moderately priced. You can easily score rooms for well under $200 a night and sometimes under $100 during the middle of the week. There are also more options for hotels that are within easy driving distance and offer free or discounted shuttle service to the park. What To Do At Main Street, U.S.A. This slice of Americana is modeled after Disney’s hometown of Marceline, Missouri, and acts as a nostalgic entryway into a few of the other lands. Forced perspective buildings that appear larger than they actually are line the street, pumping out the delicious scents of popcorn and chocolate, and characters like Goofy, Donald Duck, and Mickey and Minnie Mouse roam the corridor. Disneyland® Railroad: If you’re looking for a guided overview (via an automated narration) of the theme park or simply a comfortable place to relax and observe the attractions, take a seat on the 20-minute-long Disneyland® Railroad ride. Main Street Vehicles: A knowledgeable driver transports guests from one end of Main Street, U.S.A., to the other in classic vehicles ranging from a horse-drawn streetcar to a fire engine. City Hall: Find answers to your travel questions or obtain guide maps in multiple languages in this information center neatly tucked inside this picturesque building. Gibson Girl Ice Cream Parlor: Indulge your sweet tooth and cool off with a waffle cone packed with an icy sweet treat. Jolly Holiday Bakery Café: Fans of Mary Poppins will love this themed café where they can dig into a simple bite to eat or a decadent dessert like the Mary Poppins Chocolate Cake: A chocolate cake with a crème center, chocolate ganache, and more chocolate flakes than you can shake a stick at. Emporium: Don’t miss your chance to stock up on any possible Disney souvenir you can think of, or even just admire the Windows of Enchantment commemorating classic beloved Disney movies. Boldly dive into adventure and excitement in Adventureland, where you’ll experience a myriad of exotic lands and outdoor environments. Go sailing on the Jungle Cruise or enjoy tropical entertainment in Walt Disney’s Enchanted Tiki Room, and be sure to save time for a quick snack of a Tiger Tail Breadstick at Bengal Barbeque. Walt Disney’s Enchanted Tiki Room: This 15-minute show is hosted by four talking macaws who are soon joined by over 200 animated performers crooning bouncy South Seas tunes. Indiana Jones™ Adventure: A unique 12-person military-style car ride that leads you through a series of chambers inside a temple presided over by an ancient deity with a mind for revenge. Jungle Cruise: Wind your way around lush foliage bursting with animatronic animals in a riverboat helmed by cheerful skippers who skillfully navigate the twists and turns and narrowly avoid an ambush by unfriendly natives. Tarzan’s Treehouse™: A self-guided walking tour through the treetops that gives you a birds-eye view of Adventureland. Bengal Barbeque: Choose from a variety of tasty jungle skewers or a tiger-tail shaped cheese and garlic infused breadstick to quash your hunger pangs. If you’ve never had the chance to visit New Orleans or are hankering for another visit, Disneyland® Park’s New Orleans Square does this famed city justice. Expect to be serenaded by the happenin’ jazz musicians of the Jambalaya Jazz Band or the Royal Street Bachelors, and don’t miss the tinkly tunes from Princess Tiana. 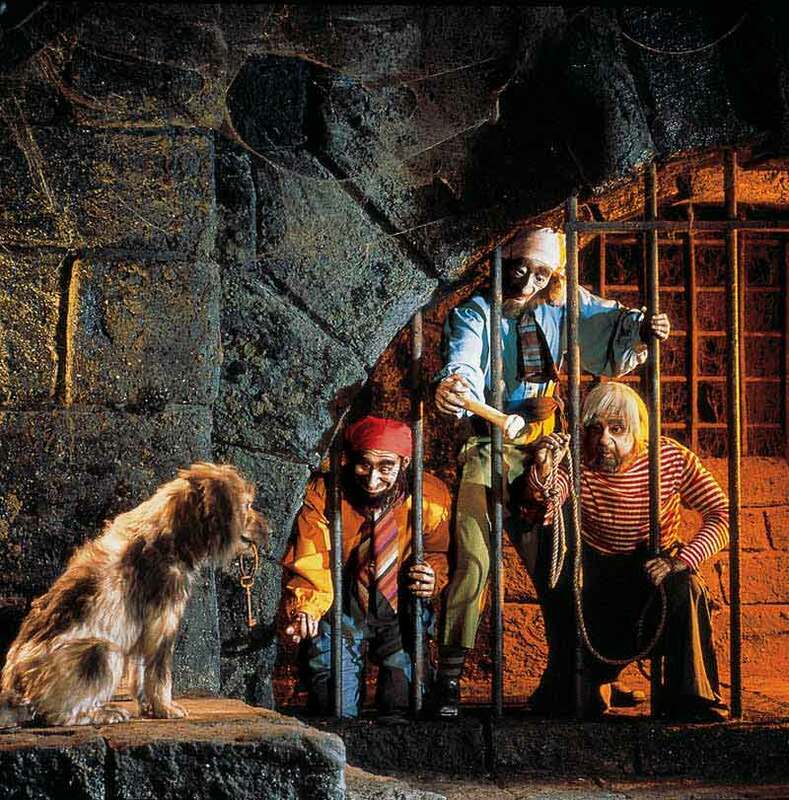 The Haunted Mansion and Pirates of the Caribbean rides are there to thrill and amuse you, and, of course, you can’t leave without stopping for a bite of delicious traditional Southern fare at one of the many restaurants and cafes. Haunted Mansion: The original owners of the house, a 19th century sea captain and his family, perished a long time ago but their spirits -- along with a host of others -- now reside inside this creepy abode that’s yours to explore... if you dare. Pirates of the Caribbean: The popular movies are based on this classic boat ride that takes you through scenes of animatronic pirate debauchery (including the famed Captain Jack Sparrow) set against a dramatic soundtrack and realistic sound effects. Blue Bayou Restaurant: One of Disneyland® Park’s "signature" restaurants featuring spectacular southern fare like N’awlins Gumbo and Crab Hush Puppies, this hotspot is actually located inside the Pirates of the Caribbean ride so diners can admire boats gliding peacefully down the bayou. French Market Restaurant: Live music and tasty food ensure an enjoyable experience overlooking the Rivers of America that feels like a private escape from the busy streets. Mlle. Antoinette’s Parfumerie: Originally designed for Walt’s wife, Lillian, the intricate details of this charming boutique will draw you in and potentially persuade you to purchase some elegant perfumes. Take an hour to relax in Critter Country. Designed with rustic appeal, you’ll encounter talking creatures who burst into song as you walk by them and enjoy a kid-friendly ride featuring Winnie the Pooh. It’s the perfect place to spend a lazy afternoon or relaxed morning before you dive back into the lively activity of the other lands. 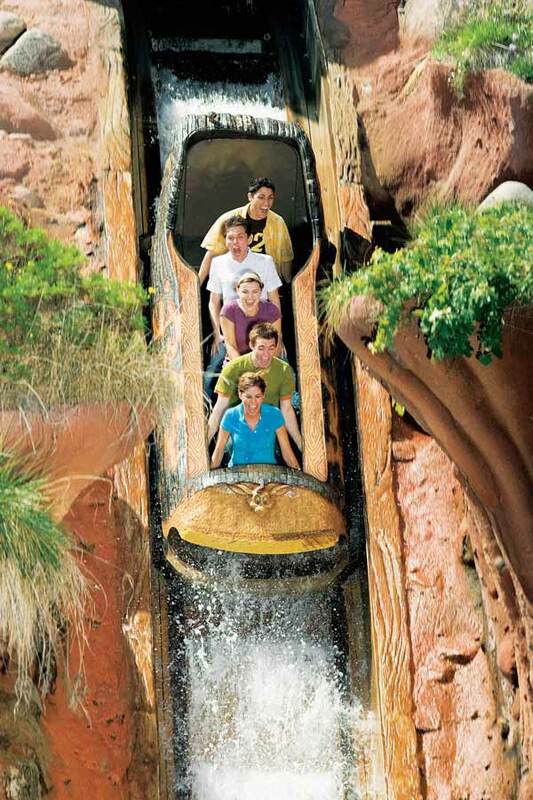 Splash Mountain: No trip to Critter Country is complete without a ride down Brer Rabbit’s famed flume, which culminates in a five-story drop down the backwoods Chick-A-Pin Hill – prepare to get a least a little wet! The Many Adventures of Winnie the Pooh: Everyone’s favorite lovable honey bear comes alive in this three-minute ride during which you’ll get to enjoy all the beloved characters who reside in the Hundred-Acre Woods. Davy Crockett’s Explorer Canoes: Embark on a sightseeing adventure on the Rivers of America aboard a 35-foot canoe powered solely by guests’ paddling, where you’ll get an entirely new view of three different lands. Hungry Bear Restaurant: For those with voracious appetites, nothing hits home like the hearty chili cheeseburgers and country fried chicken sandwiches served up at this lodge-style restaurant. The Briar Patch: Inside this cabin-themed store you’ll find an array of hats and small Song of the South accessories displayed among log-cabin style decorations. America’s Old West comes alive in Disneyland® Park’s Frontierland. Originally intended as an open space for visitors to ride wagons and mules or even meander down walking trails, today it boasts Western-themed activities, restaurants, and even a giant railroad. Try your hand at a shooting gallery or explore the winding caves of the spooky Pirates Lair on Tom Sawyer Island, and don’t miss Fantasmic!, a combination live-action and water screen performance that weaves in multiple Disney characters amidst impressive special effects. Fantasmic! : This visually stunning show illuminates the Rivers of America after dark, portraying a live-action dream series inside the mind of Mickey Mouse that features sparkling pyrotechnics and a spectacular cast of characters, including Maleficent as a 45-foot-tall fire-breathing dragon. Note: for the best views, opt for the dining and show packages. Big Thunder Mountain Railroad: Sharp turns and tumbling dips make this thrilling ride in a runaway mine car through a massive mountain a surefire hit for those seeking an adrenaline-spiking rush. Pirates Lair on Tom Sawyer Island: Take your time exploring the dirt forest trails, secret hideouts, and even a haunted grotto on Tom Sawyer Island – keep an eye out for buried gold at the Treasure Dig! Mark Twain Riverboat: Climb aboard a fully functional reproduction of a historic Mississippi steamboat and enjoy a relaxing 14-minute journey along the Rivers of America, complete with a narration describing a time when traveling was about the journey as much as the destination. Frontierland Shootin’ Exposition: Annie, grab your gun because it’s time to clock some unexpected Old West targets like tombstones, cacti, skeletons, and more as they glide past. The romantic peaks and turrets of Sleeping Beauty’s candy-colored castle are perhaps the most iconic image of Disneyland® Park. Her castle and numerous other whimsical buildings and facades comprise the enchanted expanse that is Fantasyland. You’re sure to run into a princess or two (most likely to be found in the Fantasy Faire) and don’t be surprised if you end up spending a full day enjoying rides based on scenes of your most treasured Disney stories. Take a dizzy whirl in a cup at the Mad Tea Party or ride the gallant steeds on the King Arthur Carousel, and, of course, make a point to ride the magical "it’s a small world" mini-cruise. Fantasyland is said to have been Walt Disney’s favorite part of the park and judging by the sheer volume of guests exploring its charming nooks and crannies, it clearly ranks as a must-see spot. Take this into account when planning your agenda and try to fit in smaller visits in during the parade times when crowds thin a bit. Matterhorn Bobsleds: If careening around tight curves at breakneck speeds is your idea of a fun time, make a beeline for this roller-coaster style attraction that takes you for a heart-pounding ride inside a thunderous mountain. Fantasy Faire: This is your chance to mingle with Disney princesses (and sometimes their princes), watch slapstick comedy routines about life in the royal castle, and indulge in royal fare from fantasy-themed food carts. Pixie Hollow: Experience life from a tiny pixie’s point of view, where you’ll meander amongst giant plants and flowers and have the chance to take photos with Tinkerbell and her pixie friends. "it’s a small world": This iconic mainstay of the Disneyland experience features a 15-minute boat ride during which riders watch dolls from locations around the world singing in unison and celebrating their cultural differences. Mickey and the Magical Map: Mickey has been left alone with an unfinished enchanted map, and when he tries to complete it himself a wild journey featuring some of your favorite Disney Characters ensues. Enter the Mickey Mouse universe and meet your favorite characters including Goofy, Donald, Chip 'n Dale, Minnie, and Mickey himself, of whom reside in this land. You’ll stroll down streets flanked by colorful cartoon-y houses occupied by Mickey Mouse and friends and get to explore their homes as well as a dizzying spinning teacup style ride and a tame roller coaster. While this region of the park is geared towards younger visitors, Disney fans of all ages will appreciate the incredible detail and imagination that went into designing each attraction. Chip 'n Dale Treehouse: Kids of all ages will love clambering inside Chip 'n Dale’s multi-level tree house, complete with chipmunk wall décor and a small patio. Gadget’s Go Coaster: Not to be confused with Inspector Gadget, this ride is inspired by Gadget Hackwrench from Chip 'n Dale Rescue Rangers and features a quick jaunt around Toon Lake. It’s perfect for younger kids and those who prefer a calmer roller coaster experience. Mickey’s House and Meet Mickey: You’ll feel like a kid again in this icon’s house where the decorators spared no expense in creating a magical environment. If you’re lucky Mickey will be in his screening room waiting to give you a hug. Donald’s Boat: Like Goofy’s Playhouse and Chip 'n Dale’s Treehouse, Donald’s Boat is the perfect place for rambunctious wee’uns to burn off some energy amidst Donald’s cozy living space. Unlike the other playhouses, it’s big enough for families to play together and generally isn’t too busy. Roger Rabbit’s Car Toon Spin: Relive the fun of the 1989 hit Who Framed Roger Rabbit in a spinning ride that allows riders to choose the level of intensity as they whirl through this wild adventure. The future is here at Tomorrowland. Innovation and imagination about what the future holds run wild in a place where you can explore the galaxy with Buzz Lightyear, learn some Jedi mind tricks, and even dive deep beneath the sea in a submarine voyage with everyone’s favorite wayward fish, Nemo. This land has gone through multiple incarnations throughout its existence and its reinvention serves as a nod to the pervasive adventuresome spirit. Tomorrowland is a place where nothing is impossible and the only limit is your imagination. Interesting trivia: when Tomorrowland first opened in 1955, it was intended to be a vision of the world 30 years into the future. Space and sci-fi fans will go bonkers for the rides and attractions at Tomorrowland. That said, this popular region of Disneyland has multiple exciting attractions that will thrill and inspire even those who have never seen a Star Wars movie. Star Wars Launch Bay: Take a gander at real props and costumes from Star Wars movies and shake hands with Chewy and Darth Vader in this interactive exhibit. Buzz Lightyear Astro Blasters, inspired by Disney•Pixar's Toy Story 2: Pile into Astro Blaster ships to help Buzz fight the evil Zurg by shooting lasers at targets that come at you from all angles. Space Mountain: Roller coaster lovers, don’t miss this dizzying ride that hurdles you over steep dips, inclines and sharp turns, all in darkness. Finding Nemo Submarine Voyage inspired by Disney•Pixar's Finding Nemo: Immerse yourself in the underwater world of coral reefs and curious ruins of ancient civilizations, and help Dory and Marlin find their lovable friend Nemo before the anglerfish get to him first. 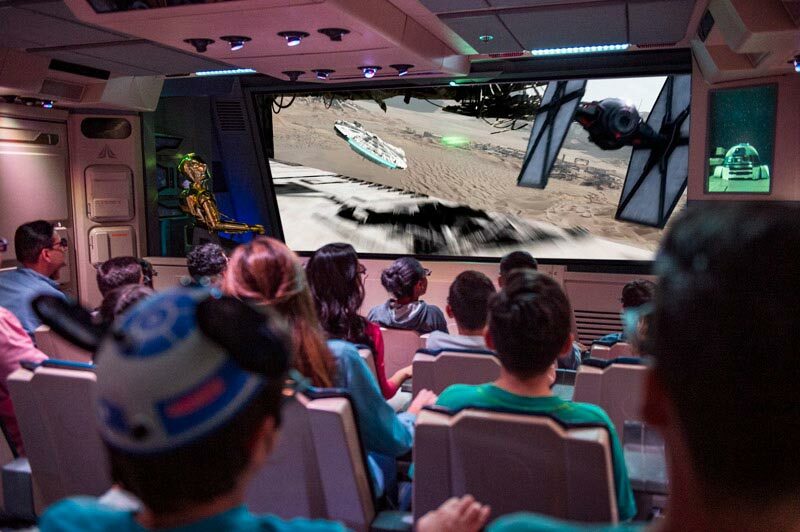 Star Tours—The Adventures Continue ©Disney/Lucasfilm Ltd.: Visit a galaxy far, far away and come face-to-face with some of your favorite Star Wars characters as you voyage to distant worlds with Star Tours. While Disneyland® Resort is a vacation unto itself and a Southern California CityPASS can help you get the most bang for your buck, there’s so much local flavor to soak in around the SoCal area. Thanks to its balmy weather and beautiful scenery, Southern California is considered a top vacation destination. Biking fans can ride on "The Strand" bike path, a 22-mile paved trail that affords you views of adorable coastal towns and rolling waves hugging white(ish) sand beaches. If you’re into hiking, head to Runyon Canyon, a celebrity haunt that also happens to be filled with pristine hills perfect for running or trekking. If you’re into human performances, make sure to stop by Venice Beach to watch talented street performers practice their craft. Surfers will think they’ve died and gone to heaven after catching waves on Huntington Beach or Surfrider Beach in Malibu, and even couch potatoes can snag tickets to attend a television show taping for a variety of shows. Theme parks like SeaWorld® San Diego, Universal Studios Hollywood™, and LEGOLAND® California are exciting attractions to thrill and inspire you, and with over 100 acres filled with Mother Nature’s finest, the San Diego Zoo is a must for animal lovers. If you’re planning on spending a few days or more in southern California, check out Southern California CityPASS. It grants you great discounts to these top destinations and others, so you can see more and save more! TARZAN™ Owned by Edgar Rice Burroughs, Inc. and used by permission. COPYRIGHT Edgar Rice Burroughs, Inc. and Disney Enterprises, Inc. All Rights Reserved. As to Disney artwork/properties: ©Disney ©Disney/Pixar © & TM Lucasfilm Ltd.
Attractions and entertainment are subject to change without notice.